The journey of becoming a designer is a long one, which makes listening to someone recap it for you a fascinating process. Fariba Soltani is quiet a striking character, a woman who clearly sees where she is going and who is not afraid of the challenges that her career presents her with. Fariba launched her eponymous line of designer scarves in the beginning of this year and was offered a place on Fenwick’s ( in Bond street ) accessories department shelves three months later. Knowing fully well that it is by no means an easy task, I observed Fariba closely, intrigued by her, as we chatted animatedly over juice. In real life Fariba appears exactly the way that a photographer’s lens captures her. An average height, with shortish raven black hair, a vivid red lipstick framing her lips, wearing impeccably white shirt and one of her scarves draped casually around her neck, she certainly comes across as a confident, modern woman. She was born in Iran and lived there until the age of 25, when she moved to London, following the winds of change. Fariba’s parents tried to push her towards a career in medicine but as Fariba told me, ‘medicine never charmed me’. Somehow, intuitively, she knew deep inside that she wanted to evolve creatively. Having gained a Bachelor degree in Interior Architechture from Kingston University, Fariba ended up working for the practise of the renowned architect Sir Norman Foster but ruefully admits that when one works in a practise like that, work becomes your life. Having gained the experience, Fariba moved on, taking freelance work, residential and interior design projects, which included work for the Fox Linton design office. 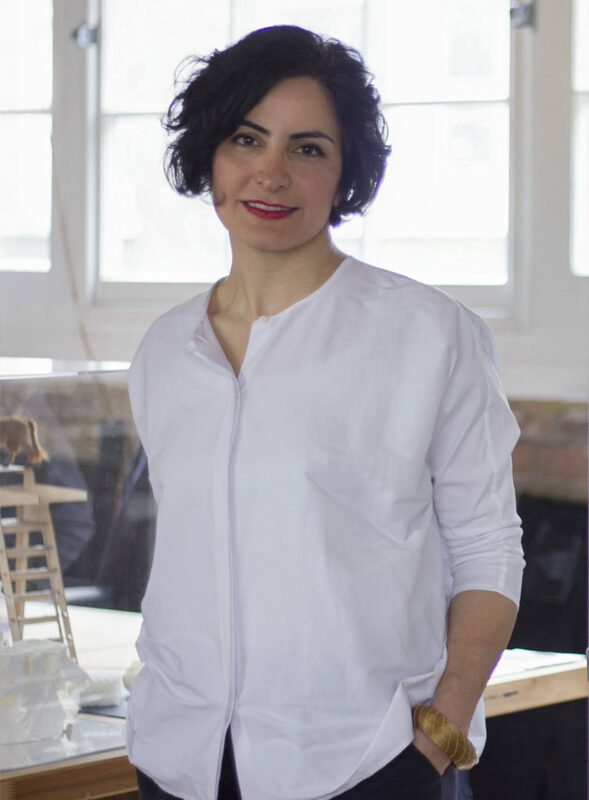 What became apparent from early on in Fariba’s career in architecture is that when you work for someone, you have to follow ‘signature’ design, instead of allowing your creative flair to flow freely. Eventually, Fariba came to a very clear realisation that she wanted to develop her own products, instead of creating things for someone else. Recently I came across an interview with Frida Giannini, Gucci head designer, in Surface magazine, where she mentions that ‘ in fashion architecture is important’, so it should come as no surprise that Fariba started a line of designer scarves, utilising her visual, as well as artistic skills that she continues to develop and refine with every collection. Drawing inspiration from architecture & patterns, but most importantly her homeland’s culture, Fariba’s scarves become an endless source of wonder and delight for anyone who lays their eyes on them. Yet it was watching a TV programme about Liberty’s of London and catching a glimpse of the prints of colours of stones done by Richard Weston ( a well-known lecturer, who has his own studio which uses digital date to capture natural materials like shells and rocks to create a wide variety of products ) that sparked an idea in Fariba’s heard that is like a cauldron of creativity. Having found an Italian company in 2013, within three weeks Fariba had her first set of test of scarf prints. So far she has produced and created one collection, with the second one, The Salda, being shown in Paris at a trade show on September 26-29 and launched publicly in Feb/March 2015. Initially Fariba wasn’t sure how to present her idea, as it was concept based around the journey of creating a piece. So Fariba started with taking lots and lots of images in order to create multi-layered prints for her scarves. When you see them in real life you don’t know whether you want to wear them or frame them and hang them on the walls of your home, like works of art. When a collection is being created, it isn’t about the quantity of designs, it is about the design satisfaction level. Fariba picks up a topic she knows nothing about and starts exploring, choosing colours ( her designs aren’t trend related, thus giving them a timeless quality ), finding references in artwork, expanding, digging, until the idea becomes complete and breathes life into each design. Fariba’s first collection, called ‘The Atrisa’, was inspired by fast-moving phenomenons around us, when eyes don’t have a chance to adjust the magnitude when racing against time. This collection is subtly vibrant, catching the hidden beauties & letting you wear moments frozen in time ( combining the sensuality of silk & the softness of modal ). Fariba told me that in ancient times fire was considered to be a cleansing element and when she explored images of smoke blending away into the air, she wanted to take its images to another level. In addition she named every scarf in that collection with a term related to the name of the fire. To understand the point, just pause & examine carefully the intricacy of The Afshid, which blends white, black and yellow in circle shapes bleeding into grey border, in turn overlaid with futuristic features. Another scarf in that collection, The Flamak, took months to develop and when you examine it, flowing like a breeze over your arms, your mind starts to escape into the land of dreams & discoveries. When I asked Fariba about her customers, she told me that they vary in age but her designs are meant for women who know what they want. They know & understand their fashionable preferences, which generally whisper, rather than scream. Like Fariba, her customers might wear a simple outfit with the scarf introducing the only pattern into the final look. Some of Fariba Soltani scarves are hand-stitched, making them more expensive but buyers certainly pay attention to the quality of the work, as well as mesmerizing images that are full of energy and movement. In addition to modal and silk, Fariba sometimes combines satin silk & twill silk as combination of those two materials works beautifully, with the extra shimmer bringing the pattern out ( you can choose a scarf made in modal, twill silk, 100% silk and satin silk ). I walked away from our meeting feeling that I have met someone incredibly gifted, who wasn’t afraid to take a leap of faith to follow her creative dream. Fariba’s designs combine elegance, freshness & boldness which in turn will allow her customers to be almost effortlessly stylish & that to me signifies the union of heart and mind when it comes to design that stands the test of time. For more information about Fariba Soltani & her unique scarves collections, available to purchase, go to the website here. Prices start at £80.